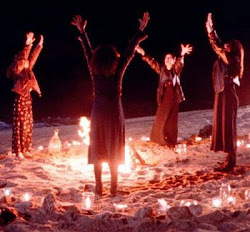 The Witching Hour: Witch Hunting? There's an App for That. 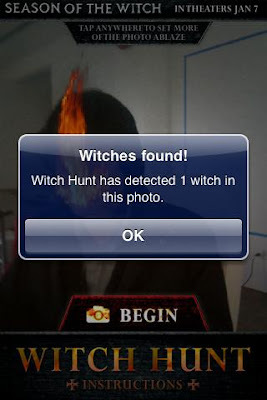 As part of the increasingly gadget-oriented hype ploys for Season of the Witch, now Android users can get a "Witch Hunt" application for their smart phones. I found this via the film's Facebook page which linked to the app's page on the AppBrain website. The description begins "Witches walk all around us. They are responsible for great devastation, performing harrowing evils from the guises of the shadows." And it goes on from there. Apparently you point your phone at a group of people in your immediate vicinity, and take their photo. Then the "Witch Hunt" application identifies which ones are witches, and then it "burns" them for you! Oh, and check it out...it's FREE. So, what do you think? Is this every bit as offensive as the "anti-gay" Android app "Bendroid" that was lurking around last year? Or is it just a bit of fun? I'm gonna go with "C"- awesomely bad marketing ploy that will go largely unnoticed except by a small but appropriately cult-like fan following due to the sheer ridiculousness of such a thing. "Someone has to much time on their hands and no life....give me a break"
Do you mean the App inventor? Or the blogger?